Texas will not expand Medicaid or establish a health insurance exchange, two major tenets of the federal health reform that the U.S. Supreme Court upheld last month, Gov. Rick Perry said Monday morning. Texas will not expand Medicaid or establish a health insurance exchange, two major tenets of the federal health reform that the U.S. Supreme Court upheld last month, Gov. Rick Perry said in a Monday morning announcement. "I stand proudly with the growing chorus of governors who reject the Obamacare power grab," he said in a statement. "Neither a 'state' exchange nor the expansion of Medicaid under this program would result in better 'patient protection' or in more 'affordable care.' They would only make Texas a mere appendage of the federal government when it comes to health care." Perry's office sent a letter to U.S. Health and Human Services Secretary Kathleen Sebelius on Monday morning asserting his opposition, both to accepting more than a hundred million federal dollars over the next several years to put more poor Texas adults onto Medicaid, and to creating an Orbitz-style online insurance marketplace for consumers. 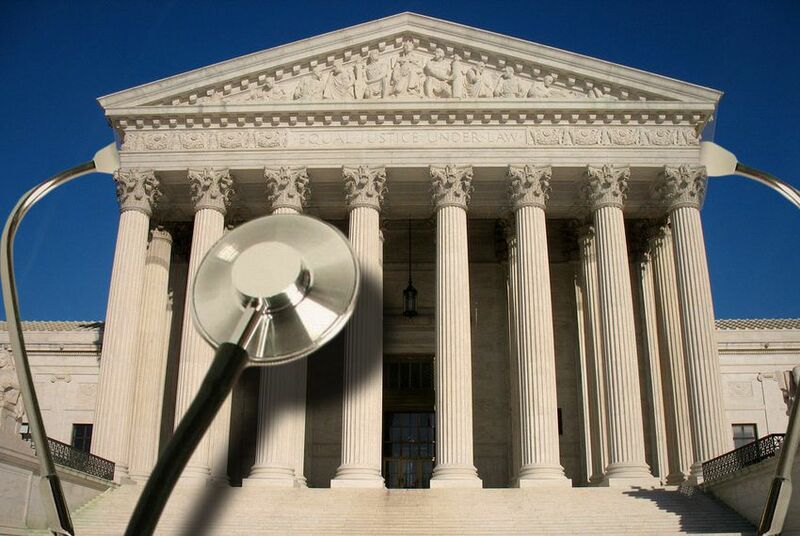 The U.S. Supreme Court has ruled that states — even Texas, which has the country's highest rate of the uninsured — may not be punished for opting out of the Medicaid expansion. On Monday, Perry called it the equivalent of adding more people to a sinking Titanic. But Dan Stultz, president and CEO of the Texas Hospital Association, said that without the expansion, "many will remain uninsured, seeking care in emergency rooms, shifting costs to the privately insured and increasing uncompensated care to health care providers." "With a strained state budget, it’s hard to imagine addressing the uninsured problem in Texas without leveraging federal funds, which will now go to other states that choose to expand their Medicaid program," he said. The insurance exchange is not optional; if Texas doesn't devise its own, the feds will establish a one-size-fits-all program for the state. But Perry's office says the idea of a state-run exchange is "an illusion — we either implement what they want or they do it for us." “If anyone was in doubt, we in Texas have no intention to implement so-called state exchanges or to expand Medicaid under Obamacare," Perry said in a statement. "I will not be party to socializing healthcare and bankrupting my state in direct contradiction to our Constitution and our founding principles of limited government." "No person with a speck of intelligence would turn down billions in federal dollars that would be a boon to our economy and help Texans," spokeswoman Rebecca Acuña said in a statement. "... Rick Perry’s Texas solution is to let Texans stay ill and uninsured. That is not a health care plan." It also follows several conversations his office had with medical and hospital associations last week — including groups that would much prefer to see Medicaid expanded. Lawmakers on both sides of the aisle have suggested that, barring a statewide Medicaid expansion, they might give regions or local hospital districts the green light to try to negotiate with the federal government for their own communities. Perry's office said that while the governor knows the Medicaid expansion issue is "one he will have to work with the Legislature on," it was important to him to voice his opposition. "He will fight in the upcoming Legislature to ensure it is not expanded," his office said in an emailed statement. It would be a big loss for the Centers for Medicare and Medicaid Services if Texas, the state with the highest percentage of uninsured residents, didn’t partake in the Medicaid expansion. That could give state leaders quite a bit of leverage to try to bargain with Washington for a waiver — one that required Medicaid enrollees to have more skin in the game, for example. But Perry's statement on Monday morning didn't leave much room for negotiation — at least if it's under "Obamacare." "I look forward to implementing health care solutions that are right for the people of Texas," Perry wrote in the letter to Sebelius. "I urge you to support me in that effort. In the meantime, [health reform's] unsound encroachments will find no foothold here."